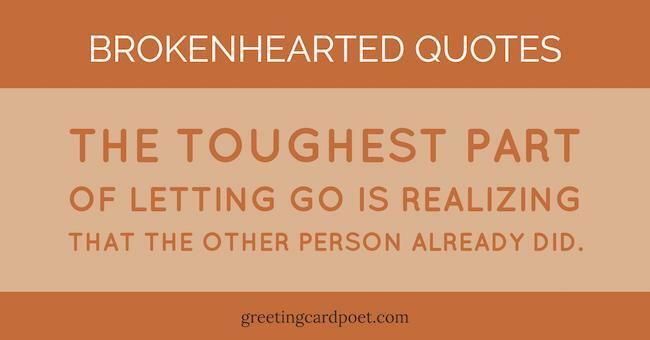 These brokenhearted quotes and sayings will give you much to think about. Love is the most beautiful thing you can find, but it never comes with guarantees. The same person who means the world to you can leave you shattered, without any words or even the interest to speak to you ever. Someone who said that you meant the world to them, could change into a total stranger quickly. Almost everyone has experienced a broken heart. Just like love can be the most beautiful of things, a broken heart can be the most painful thing you could ever experience. Relationships bring with them a certain level of risk. It is also one of the most difficult pains to heal. If someone breaks your heart, it can be a very difficult transition to feeling good again . Here are some famous broken heart quotes and sayings that might help you, or someone you know, understand what it feels like. I wish I never fell so deep in love with you and now it ain’t no way we can be friends. My sadness has become an addiction. When I’m not sad, I feel lost. I start to panic trying to find my way back which leads me back to my original state: sadness. Love is blind, but a broken heart sees everything. The worst feeling is not being lonely. It’s when someone makes you feel special, then suddenly leaves you and you have to pretend you don’t mind at all. To meet, to know, to love—and then to part, Is the sad tale of many a heart. Stab the body and it heals, but injure the heart and the wound lasts a lifetime. The actuality that the heart does not want to feel, doesn’t negate the certitude that it once felt and will still feel. There’s a difference between letting go, and pretending you’ve forgotten. I think many people can relate to that excruciating pain of love gone wrong. I’d rather have a broken arm than a broken heart. Throughout my lifetime I’ve left pieces of my heart here and there. And now, there’s almost barely enough to stay alive. Love does not begin and end the way we seem to think it does. Love is a battle, love is a war – love is a growing up. Our story has three parts: a beginning, a middle, and an end. And although this is the way all stories unfold, I still can’t believe that ours didn’t go on forever. A lot of you cared just not enough. I love the way you refuse my love. Yet leave me not; yet, if thou wilt, be free; Love me no more, but love my love of thee. Love is ironic. Only when you hurt someone, they realize they truly love you. We shall always fall in love with the people who break our hearts. It hurts to breathe. It hurts to live. I hate her, yet I do not think I can exist without her. You are supposed to dry my tears, not cause them. The worst feeling in the world is knowing you’ve done everything you can to show someone you love them, and yet they still choose someone else over you. The worst kind of pain is when you smile only to stop the tears in your eyes. When it’s gone, you’ll know what a gift love was. You’ll suffer like this. So go back and fight to keep it. A dream you once were, a dream of all my realities, a dream I can no longer strive for, in the wake of many betrayals. The worst feeling isn’t being lonely; its being forgotten by someone you would never forget. It is a curious sensation: the sort of pain that goes mercifully beyond our powers of feeling. When your heart is broken, your boats are burned: nothing matters any more. You cannot fly with broken wings and you cannot love with broken heart. I don’t think, until you’ve actually lost somebody you really love, that you can go through that door that allows you to be grown-up. Love is an untamed force… When we try to understand it, it leaves us feeling lost and confused. Where you used to be, there is a hole in the world. Hearts are breakable. Even when you heal, you’re never what you were before. If you have suggestions for brokenhearted quotes and sayings, please use the contact page to let us know. We appreciate it.